Published on February 16, 2015 February 16, 2015 by Rachelle J. Currently Reading: Those Rosy Hours at Mazandaran, a review book, The Sparrow by Mary Doria Russell, Little Women by Louisa May Alcott for The Classics Club, The Fiery Cross by Diana Gabaldon, The Essential Feminist Reader, and War and Peace by Leo Tolstoy, because I’m insane. Also, there’s a read-along for it. Finished: 1536: The Year that Changed Henry VIII by Suzannah Lipscomb, and The Very Best of Kate Elliott, which I reviewed on Saturday. I might post an edited version of the paper I had to write on 1536 as a sort of review once I get it back from the professor. Winter 2014-2015 COYER Progress: I’ve read 8 books towards my goal of 10, and participated in 2 read-a-thons towards my goal of 3. I’ve been keeping up with the Facebook group, and I finally did a mini-challenge! 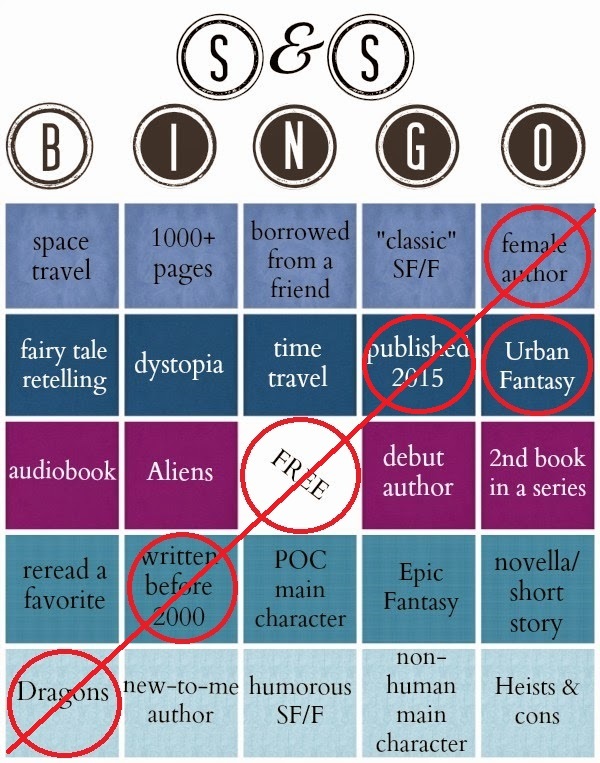 SF/F Bingo: BINGO! The Very Best of Kate Elliott was published this year, I’ve read a book containing dragons (The Sunken by S.C. Green), a book by a female author (The Eterna Files), a book published prior to 2000 (Walking the Labyrinth by Lisa Goldstein) and an Urban Fantasy (The Kingdom Lights by Steven V.S.). My “Free” book is Tommy Black and the Staff of Light by Jake Kerr). Now that I’ve met this challenge, I’m going to attempt to fill in the whole card. Total number of books for the year: 9. I’m still behind schedule and had to move back the review dates for this month’s books again. Also, I made the mistake of forgetting to download a review book before it was archived *face palm*. I had an exam and 2 papers to write this week, and I’m busy writing more papers over the next 2 weeks, so I’m not likely to get caught up with all my review books this month.